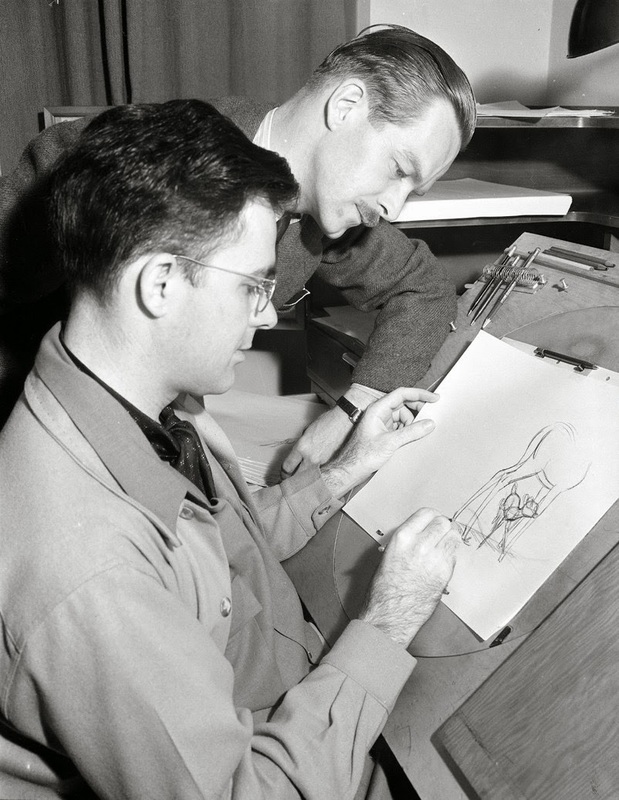 This is young Frank Thomas showing an animation sketch to an onlooker, who I believe worked at the studio as well. 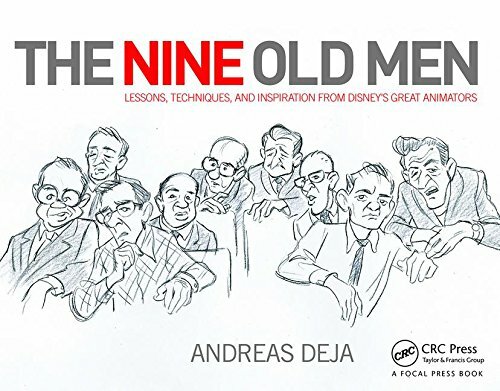 They both look very serious, yet in those early days at Disney the working atmosphere was pretty casual with plenty of time for practical jokes and silly activities. "Frank had one of these big candy suckers with a big piece of doweling for the stick. It was wrapped in cellophane with a ribbon. And I told him that I would just love to smash that thing down on his work table and find out what would happen to it, you know. It might be disappointing where it would just break up inside the cellophane or what ? And so when we finished with Bambi we decided that I could break his sucker. And I took this thing, and his work table was just the right height, and I swung this thing down with a lot of force. It must have hit it absolutely perfectly flat, because a sharp, loud report…and there was nothing there but the stick. And actually this thing, it was back in all of the shelves. There was a drawing thumb-tacked on a wall, it looked like one of these transparent easter eggs. Sugar coating like on glass, you know, the drawing was just coated…and it was back in the drawers and in the cuffs of Frank's trousers, and mine. Then when you walked on the carpet, when you lifted your foot, it would go klack- klack- klack. It was hard candy, but it was amazing , this stuff is just like glue, and it was just terrible. It took a long time to get that all out of there. We had the janitors busy for a while, because it really just disintegrated, it was like an atom bomb."